The third pair of bedsocks for grandchildren. This is for Miss Ten. I've done some for her brother and sister and when this pair is finished, I'll have only two pairs left to do. These are warm and quick. 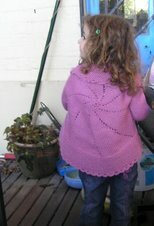 Patonyle again and some Bendigo 5 ply, machine washable. A grey mix of Patonyle and a lavender coloured Bendigo 5 ply. I've had Miss Eight here for several days even though school has gone back. She was really quite ill and we were all worried about her. 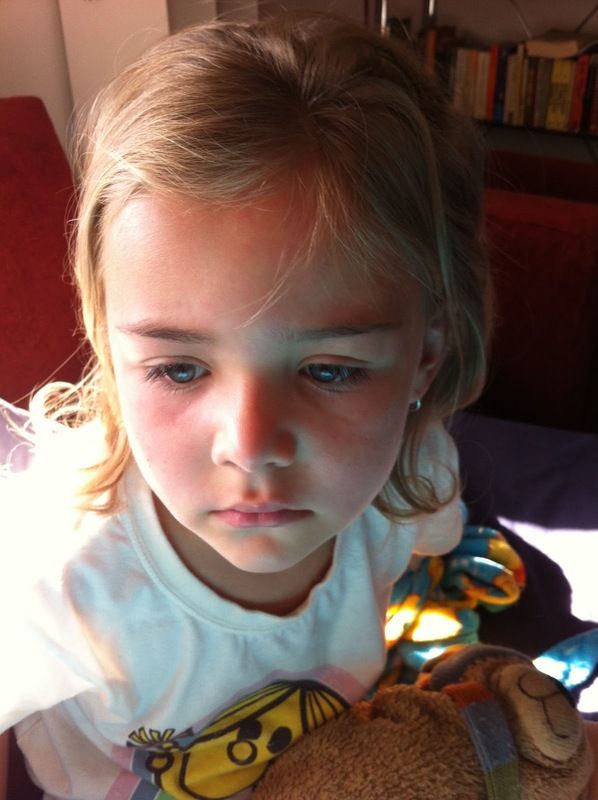 She saw two different doctors and spent one night in the Children's Hospital at Westmead where she was seen by more. The best they could come up with was that it was a virus. Someone on Ravelry said they knew the name, TALOIA, meaning There's A Lot Of It Around. She really was quite ill and I had to concentrate on getting fluid into her. When I had done that, I turned to tiny amounts of food with Nutella toast, cut into tiny pieces, really less than a bite. An apple sliced and arranged as a flower, small pieces of ham rolled up and secured with a toothpick. Things that were different and a bit fun to eat. Some mashed potato which is her favourite vegetable, although it's not mine. Anything I thought she might eat, even in tiny quantities. 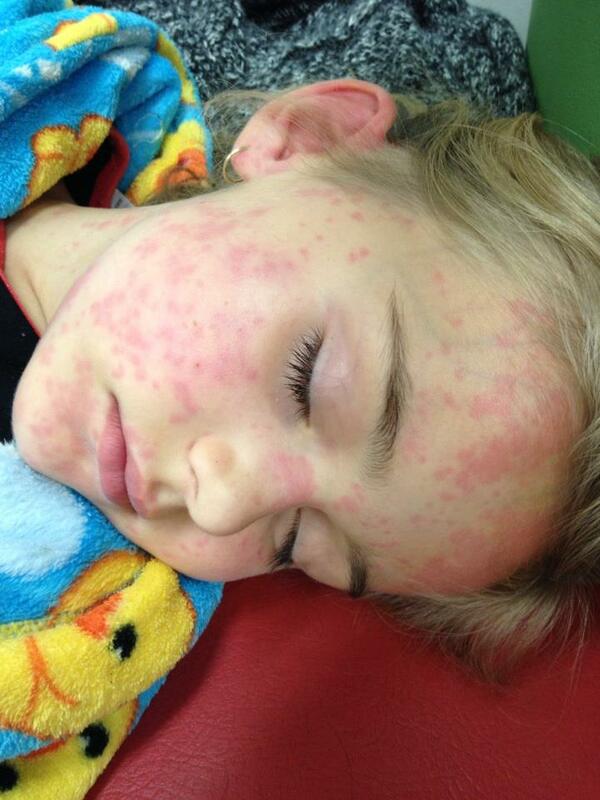 The top picture shows what she looked like when she arrived and there is another picture with an even worse rash. Not measles, not an allergy, not meningococcal. The rash was all over her body. She was totally listless and slept almost all the time. The lower picture was taken yesterday after a few days here. The rash is going although it flared some of the time. As you can see, she still looks quite ill and not very animated. I tried on Thursday to get her to have a wash, there'd been nothing like that since Monday, but she'd heard the doctor saying washing would make it worse. What was meant was that a hot bath or shower would aggravate the rash. It took a lot of swift talking on my part, but she finally consented to a very quick sponge down with lukewarm water and a soft washer. She did concede it made her feel better. She's gone home for the weekend and was very glad to see her mum when she came to pick her up. This little miss can be a handful but not this time. In fact, she was so listless and quiet I might have appreciated a bit of being a handful! 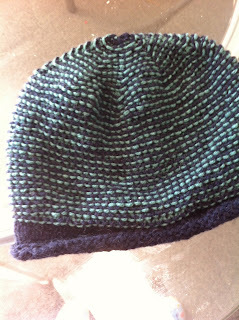 I not only did bed socks, I also did a hat with some yarn from Renae at suzyhausfrau in Canberra. I love her service, always pleasant, helpful and very quick. It is camel from baby Bactrian camels. The colours are agate and neat navy. It is a heavy 8 ply and will be very warm. It was an easy knit and didn't need much concentration. This is the medium size and is very cosy. 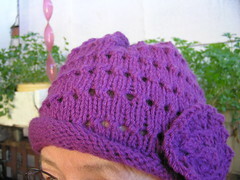 I used 4.5 mm on the stocking stitch band and 5 mm for the hat itself. Thats wonderful to hear good reports of this shop,I really need a good thick mans work jumper,theres none out there in the work wear range for women,the temps in winter here go below 0' and even with an over coat its hard to get warm and be free enough to work,wool wins everytime, just have to work out my size! 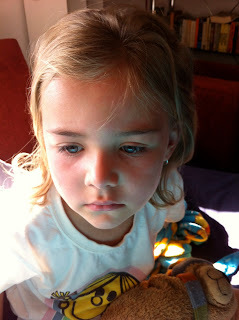 Oh I do hope your gorgeous little granddaughter is feeling better. Perhaps it was better that she slept a lot so as not to irritate the rash anymore. The socks look great and will be perfect for winter time! Poor darling, she looks so sad! I pray she returns to normal very soon. Oh she does look miserable and the rash looks very nasty. I love the TALOIA, I think I had that a fortnight ago. It is a worry when your family is ill. You must be a very good carer to persuade her to have a bath. Nice bedsocks, I love your colour combinations and a nice hat too! !